Trees require certain essential elements or nutrients to function and grow. For trees growing in a forest site, these elements normally are present in sufficient quantities in the soil. Landscape tree or urban trees, however may be growing in soils that do not contain sufficient available nutrients for satisfactory growth and development. Top soil often is removed during construction. Leaves and other plant parts are removed in landscape maintenance, disrupting nutrient cycling and the return not organic matter to the soil. It may be necessary to fertilize or to adjust soil PH to increase nutrient availability. Fertilizing a tree can increase growth and can under certain circumstances help reverse declining health. However, if the fertilizer is not needed or applied in correctly, it may not benefit the tree at all. In fact, it may increase susceptibility to certain pests and accelerate decline. Trees with satisfactory growth and not showing symptoms of nutrient deficiency may not require fertilization. Trees growing in turf that is heavily fertilized may not require additional fertilization. 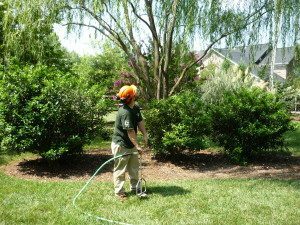 It is important to recognize when a tree needs fertilization, which elements are needed and when and how they should be applied. The most accurate way to determine a trees nutrient needs is to obtain laboratory analysis of the soil and leaves to determine the need for fertilization three analyses should be considered. Foliar nutrient analysis is used to determine the current nutrient content of leaves. Results provide information on which nutrients have been absorbed and trans-located within the plant. This method is most accurate for determining deficiencies of most elements. However it does not provide information on which the nutrients are deficient. Foliar nutrient analysis usually is more expensive than soil analysis. It should be noted that a soil analysis will have greater value if done in conjunction with a foliar analysis. Concerned that your soil lacks the nutrients that are vital for healthy vigorous trees? Contact us today at (831) 508-8955 for a FREE cost assessment for prescriptive fertilization! We have over 25 years of professional experience and serve all locations in Santa Cruz & Monterey!